I'm new to this forum but wanted to warn others of my ISP - BT. Selecting BT's "Inclusive" extras during your contract period leads to your contract being extended without your knowledge !! Anyone else experienced this appalling behaviour from their ISP? In March 2012, I bit the bullet and selected FTTC Fibre Broadband which had just been installed in my neighbourhood. BT's Infinity service was the only option so I accepted the premium of £25/month with a hope other ISPs would offer better deals after my 18 month contract ended. I went from 2Mb to ~35Mb download speed and was very happy. 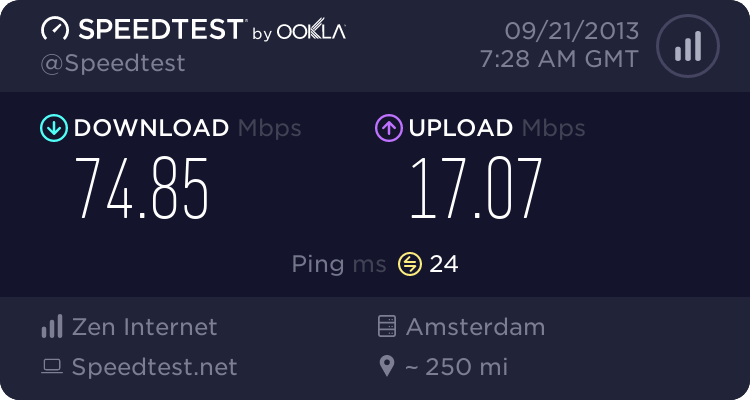 In May 2012, BT offered the new BT Infinity 2 with "Twice the speed" offering, as an IT professional that works from home, I called BT and accepted the upgrade but was told that they would start my 18 month contract at that point for this enhanced speed (incidentally, it only went up to approx. 44Mb download but the uplink speed increased significantly - for the price of a 2 month contract I lived with it. In May 2013, I enquired about BT Sport, their new channels on SKY that was free to BT Infinity customers. I called BT but then declined as they would extend my contract a further 12 months. I'm not that big a football fan !! In Oct. 2013 I enquired about my contract end date - Due in November and to apply for a MAC to transfer to a lower cost fibre broadband supplier such as PlusNet or Sky. I was shocked to find my contract end date was now November 2014. After a delayed response from BT, they eventually said that I'd signed up for BT Cloud storage service online in May. They state that it's in the Terms and Conditions it extends the contract. I checked the T&Cs and there is no mention of the contract term being extended however, it says in the "Legal Stuff", that "Some existing BT Broadband customers may need to re-contract to get 50GB" - That to me does not seem a legal and binding statement !! In "My BT's" Extras, BT Cloud it advertises BT Cloud as "Free" and "Inclusive" and I can't recall when I signed up for BT Cloud that I was agreeing to an extension of my contract by it starting again. Had I known that I would not have continued. I'm now trapped in my contract just because I accepted one of BT's "Free" services without knowing what the consequences were. I'm challenging this now with BT and will take to the Communications Ombudsman and/or take legal advice if BT won't back down. BE WARNED - BT should make these changes to your contract much clearer on their Website and this is why I wanted to make Think Broadband member aware of this !! I'll update this post with the response I get from BT. There is a free level of BT Cloud (2GB if memory is working) and then upgrades to 50GB are available to order, though the more expensive products come with this level as standard. Have you verified what level of storage space your BT Cloud is giving you? Infinity 2 which it sounds like you are on has the 50GB storage for free, so as you started on the 80/20 service I think before this was offered they may have managed to slip in the upgrade. Your case is a lot stronger if you have not used the BT Cloud or have only used it inside the 2GB allowance for example. On BT sport you can still watch the content with no contract extension, but only if you use the web app. Any term is only incorporated in a contract if the agreeing party (you) had the opportunity of being aware of it before the contract was formed by your agreement (Olley v Marlborough Court Ltd  1 KB 532). If a term is particularly onerous or unusual, "most explicit" notice of that term is required before contract formation if the term is to be incorporated (Interfoto Picture Library Ltd v Stiletto Visual Programmes Ltd  QB 433). I would contact BT again, stating that your attention was not drawn explicitly to any extension of the minimum contract period when you took up BT Cloud. As you believe such an extension would be a particularly onerous term, considering that BT Cloud was a free additional service you had been entitled to from the start of your BT Infinity 2 contract, you believe this is a most onerous term that, under Interfoto, was not incorporated into the contract. You'll probably have to do this as a formal complaint (otherwise it is unlikely to go to anyone aware of this part of contract law), and be prepared to take this to BT's independent alternate dispute resolution provider. There is some risk of failure, as what amounts to "particularly onerous" is a question of degree and BT Retail will try their best not to allow customers to evade minimum contract term extensions (which now seem to be a significant part of their business plan). Unfortunately, it seems that all communications service providers are trying whatever they can to get people to commit to a new minimum contract period, though this is entirely fair if people have such an extension drawn explicitly to their attention before agreeing to it. This seems to be a specific "I've already raised a problem via a Public-Forum" type of input. I've used this before & it seems to go to a higher level of UK based support - hence, the response seems to be more realistic & more productive! NB:- if you do a check on "Who's Online", you will virtually always see that there is a BT-Rep lurking on these Forums, even if they do not apparently respond - hence they are aware of the level of feedback they get! There was one looking at their PM list at 13:08 today. The link you give does of course go elsewhere, not to PM . Also looking at their PMs @ 13:38! TBH, I very rarely see an occasion that they are not on-line, but they don't often seem to directly respond to posts. They increased the storage to 50GB from 2GB for the BT Infinity Totally Unlimited package (the new one that came out earlier this year). But if you were already on Infinity then you had to switch to the new package to get the additional storage. However, I have a screen shot from when I did it that specifically states that at that time I was signing up for 12 months, not 18 (it was worth doing for me as I was a few months into an 18 month contract so as far as I am concerned it actually shortened my contract period - hence the reason I took the screenshot as "proof"). OLLEY v. MARLBOROUGH COURT HOTEL  1 KB 532 is a landmark English court decision on exclusion clauses in contract law. The case stood for the proposition that a representation made by one party cannot become a term of a contract if made after the agreement was made. The representation can only be binding where it was made at the time the contract was formed. for articles lost or stolen unless handed to the manageress for safe custody". Owing to the negligence of the hotel staff, a thief gained access' to the room and stole some of their property. whether the notice exhibited in the room formed part of the contract between the plaintiff and the defendants. The notice was not communicated before or at the time the contract was made. The plaintiff only became aware of it after the contract was made. The defendants were accordingly liable for the loss. As your quoted commentary said, Olley is technically only about exclusion clauses (clauses that act to limit or exclude the other party's liability), but, in truth, it makes a wider point. If you didn't have the opportunity of encountering a clause until you've reached the agreement that forms the contract, that clause isn't part of the contract because it wasn't part of what you agreed. However, if you had the chance of finding out but you didn't take it, for example by not reading terms and conditions you could view before agreeing to them, that's your look out - the clause is a valid and active part of the contract. I brought Olley up here because BT cannot hold a customer to a new or extended minimum contract period for taking up a free additional service unless they included a new minimum contract period as part of the terms and conditions for that service. A statement that some customers will have to agree to an extended contract period (or similar) is insufficient, as it doesn't give a basis upon which an individual customer can know where they stand. Being told about an extended minimum contract period after agreement was reached is no good as agreement has already been reached. The notices you typically see in hotel rooms these days invokes the Hotel Proprietors Act 1956. Section 2 of that Act permits hotels to limit their liability in various ways. My opinion of the private parking companies is very low - many of them try to get away with things that are unenforceable, relying on the fact that most people will not know they are unenforceable. The case that led up to Interfoto related to a car park: in Thornton v Shoe Lane Parking Ltd  2 QB 163, a man drove up to the automated barrier in a car park, which issued him a ticket. There was a notice outside the car park giving the charges and stating cars were parked at their owner's risk. On the back of the ticket, it said that the ticket was issued subject to terms and conditions displayed on the premises, which were posted next to the machine. The man was injured in the car park when picking up his car. The Court of Appeal noted that you couldn't see the terms and conditions until you'd taken the ticket from the machine, agreeing to the charges posted outside the car park, thereby forming the contract. As such, applying Olley, these terms were not part of the contract. That left the clause about cars being parked at their owner's risk, which would prevent the man's claim from succeeding. As Lord Denning noted, that clause was "so wide and so destructive of rights" that it could only be held against the man if most explicit notice had been drawn to it before contract formation. This exclusion clause was therefore held to be of no effect. Thornton v Shoe Lane Parking only applied to exclusion clauses, but the principle that explicit attention must be drawn to onerous clauses before contract formation was extended to all contractual clauses in Interfoto. I'd argue that BT's imposition of a new minimum term for the broadband service when a customer waits to take up their entitlement to a free additional service is very onerous, so it must be drawn clearly to the customer's attention to allow the customer to make an informed choice. Had the customer taken up the additional service from the beginning of the initial minimum contract period, they'd have had the advantage of that service for longer, it would have cost BT's resources to provide it earlier, and they'd be entitled to leave BT without charge at the same time as someone who didn't take up the service. Losing the right to leave BT could be costly. It could hold a customer to paying for services they no longer wanted or could get elsewhere more cheaply, maybe for an entire year (or is it 18 months?). I would also suggest that it is misleading! The use of the word "free" is clearly meant to indicate/suggest that something is without charge or cost, whereas the implication of applying an additional Contract restriction is clearly a "cost".